Its been such a long time since I updated my blog so today I wanted to share with you this gift I made for a very good friend of mine who I met while at University. I cut the file on my Silhouette Cameo and applied it to the clean pane of glass. The frame is a simple clip frame with no outer frame as you can see in the picture below. 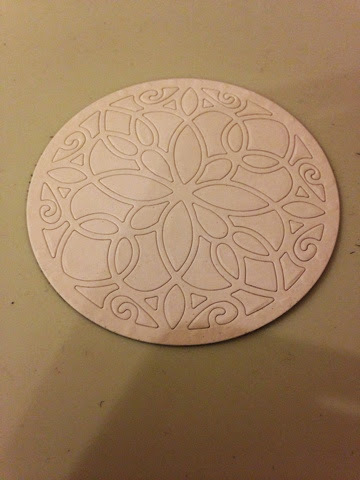 I am not sure what company the backing paper is as I bought it in a job lot from a friend and it was all loose sheets. 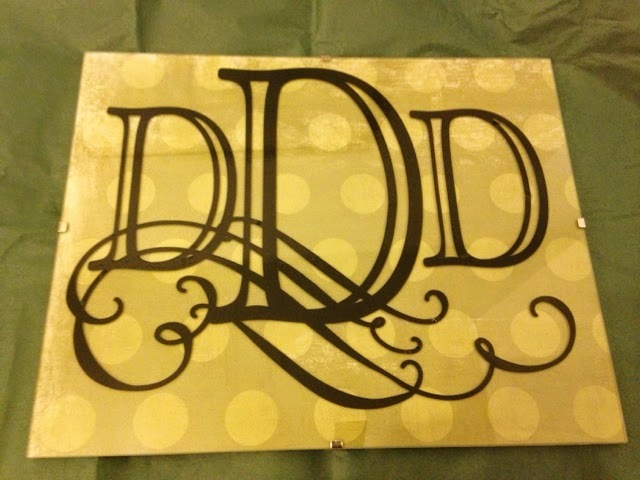 I love making these vinyl projects and I hope my friend loves this as much as I do! I hope you guys have been fine in my absence and hopefully I will get better at blogging and bring you some more projects! Hope your well and have been enjoying the recent nice weather we have been having, although today was full of rain but hopefully the sun will continue to shine through! The 13th of this month saw the launch of the new challenge and I am so sorry but I have been really in posting my design team make. I figured after Uni finished I would have more time to get on top of the things that started to slip while I was writing my dissertation but that doesn't seem to be the case. Here is my design team creation for delicious darkness! Teri makes the most amazing images and they are a dream to colour in. 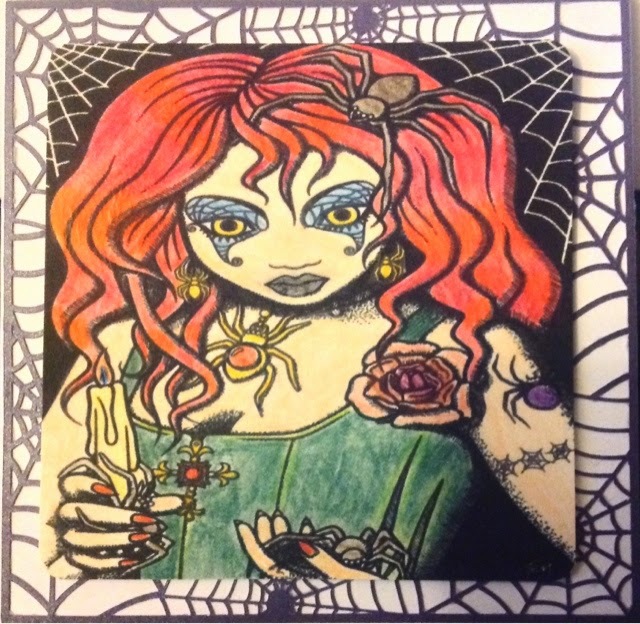 This image is called 'Back Widow' I'm not sure why I picked this one as I'm totally scared of spider haha! The web background is cut on the Silhouette Cameo in dark purple, I used purple instead of black just to give a different dimension to the backing pattern. 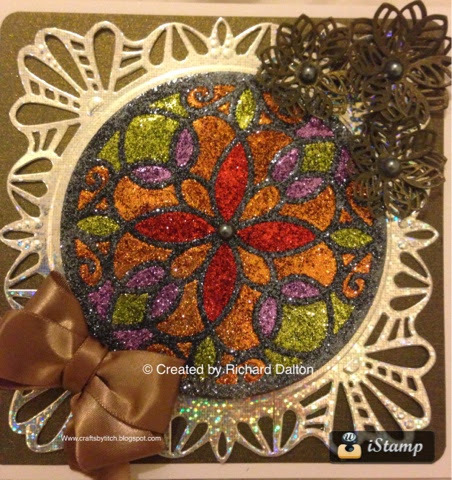 The image is coloured using W H Smith pencils recommended to me by the lovely Lisa over at Pinky Lisa's Inky Crafts. I would also like to wish Lisa a speedy recovery as she has been a bit unwell recently. I really hope you can join in and show us what you can create over on the dark side! Just remember to have a read of the rules page, we don't have many but will save any confusion. Keep crafting and I'll see you all soon! Just For Fun - July Challenge. Welcome back to my blog guys, hope you are all doing well even if the last few days have been a bit miserable due to the weather. We had a bit of a restructure in the way in which the the Design Team is operating, so, instead of monthly themes we are going to be ANYTHING GOES every month as we all know how much you love to let your creativity flow without restriction. We also will not be having a mid-month inspiration anymore as we have joined team A and B together into one big super-team. Here is my inspiration for you guys! 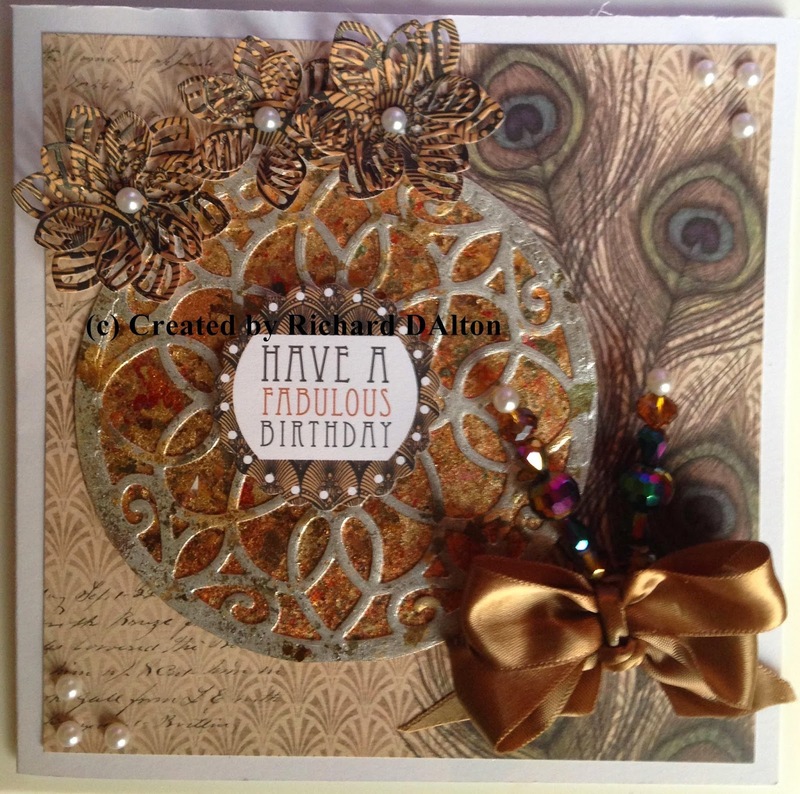 Materials used are - Craftwork Cards Backing Papers. 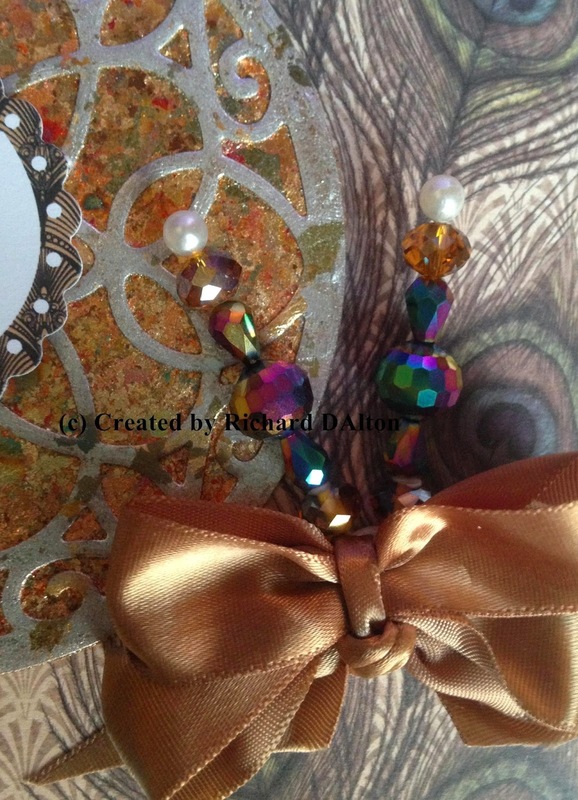 Ribbon and Beads from my stash and a 6x6 card blank. Until next time....Lots of love and crafty hugs. For this next card I have a slight confession to make! I didn't make this card in its entirety! My grandparents celebrated their 50th wedding anniversary last Friday and my sister wanted to help make a card from her and her son rather than just made by me, I was really proud of some of the choices she made although I did guide her in the right direction with some of the things she wanted to do haha! We misted some white paper roses with cosmic shimmer vintage mica mist and I made some hat pins using the beads in my stash! Hope you are enjoying the tennis and let's hope this weather keeps up! How are you all doing.......? These last few months have been so busy and lots of changes have happened which has forced me to leave my crafting behind temporarily! I just completed my degree in Archaeology at the University of Manchester. Writing my dissertation took so much of my time and drained any brain power I had left I couldn't think creatively for crafting. I moved house and all my equipment has been in storage until I could find a suitable place for it all. My sister kindly gave me access to her garage and I have a lot of work to do for it to be a working craft area but I am so grateful to her for the space. She lives two doors up so it's nice and handy! 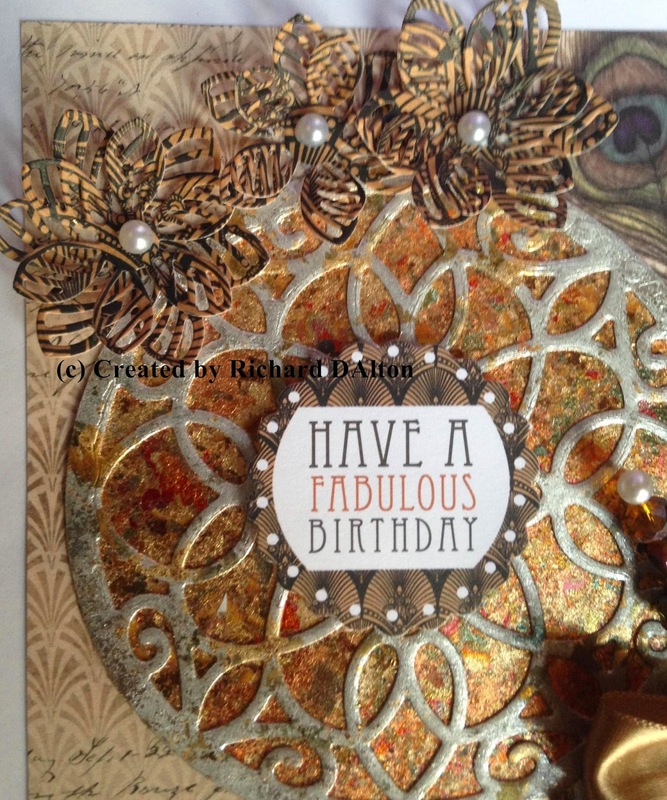 Today I have a male birthday card I made. I didn't get chance to get a picture of the card with the sentiment attached but you get the general idea of the theme. The black card stock is heat embossed with the tail section of the main image using ranger perfect medium and cosmic shimmer black detail embossing powder. The gold card is from my stash and I think it was originally purchased from pay-per-box. 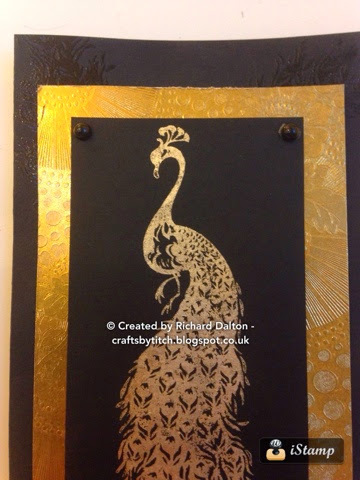 The main stamp is from inkadinkadoo and is a gorgeous peacock. I love their stamps and due to the colour of the rubber you can always find them in your stash because the bright green stands out a mile! 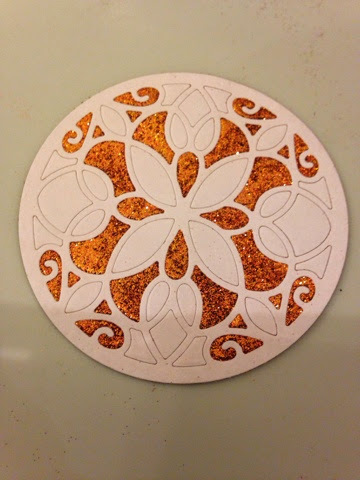 I used cosmic shimmer flake and glitter glue and cosmic shimmer golden gilding flakes! 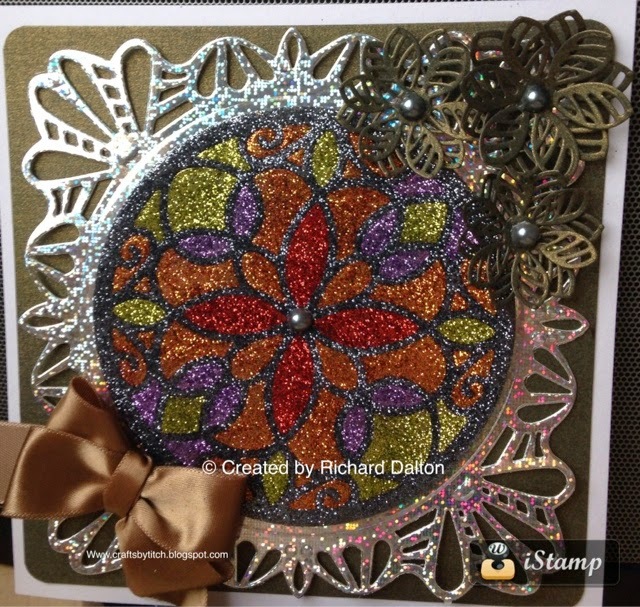 I hope you all like this card as I really do struggle to make cards for men! Anyone would think I had a natural advantage due to been a man but I really don't like making them haha! I have a couple of posts which are all going to live in the next day or two! I'm playing catch up so sorry if you all feel bombarded! 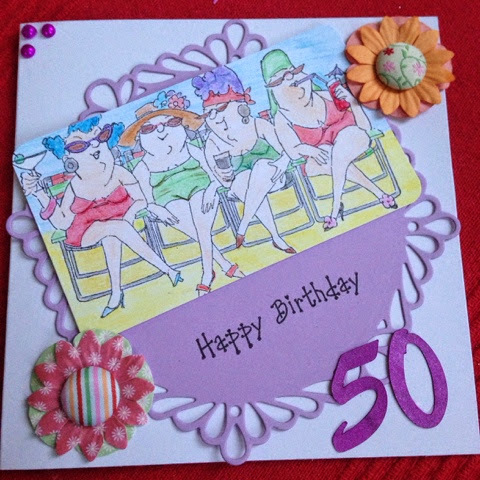 A friend of mine asked me to make a card for his sisters 50th birthday. Of course I agreed and then he said he wanted it to be a beach theme card! His sister was been taken to the Dominican I think (memory like a goldfish) so I told him to leave it with me! Of course what happens is life gets in the way and with the goldfish memory problem I left it until the last minute! My dissertation was due the same day he needed it and everything not just crafting seemed to fall by the way side! I had coloured the image a few weeks previously which had been sent to me by my aunt who stamped some her more humourous images for me to play with. I apologise for not knowing the name of the stamp but I will ask her for it unless any of you lovelies knows what it is and can leave the name in the comments box! Here is what I came up with at very last minute. I think these ladies are so cool and full of life! I would for sure be the one on the end with the martini when I grow up! Continue in the same fashion until you have the desired amount of colours you want. As a tip the general rule of thumb is you should use your darkest colour first and work up to your lightest colour as you might get some dark stuck in the lighter colour. I want edit o use the black glitter last to give my centre and aged look. 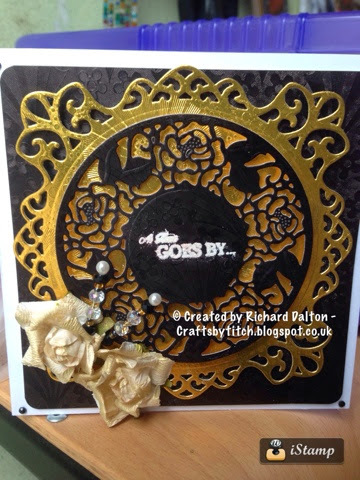 I then took the Faux Quilled Blooms die set from Sue Wilson and cut three flowers and placed a black half back pearl in the centre of each one and the centre of my stained glass centre piece. I also hand tied a satin ribbon bow in chocolate brown. 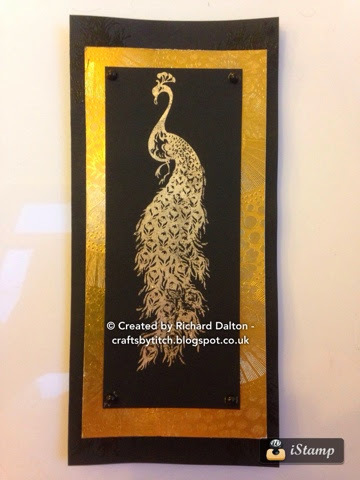 Here is a picture of the finished project in day light to show the sparkle! Colours of glitter used are -: fire Opel, golden beryl, Charoite, carnelian and hematite. Card for a sick friend.